Bus stop signs send a clear message to motorists to be cautious of bus stations. A bus stop sign tells drivers to be aware of bus traffic, as well as pedestrians as they enter and exit the bus. Seton offers a selection of bus stop signs that will deliver this message with a big impact. We offer a School Bus Stop Sign that warns drivers to be aware of children crossing the street. Offered in engineer and diamond grade reflective aluminum, this sign exceeds MUTCD requirements. Browse through our wide selection of traffic signs and bus stop signs to meet your needs today. Protect bus riders using bus stop signs from Seton. Posting a bus stop sign is an effective way to remind drivers to be cautious of heavy traffic areas; specifically of stopping buses and pedestrians who are both running to catch the bus or who are exiting the bus and walking towards their final destination. 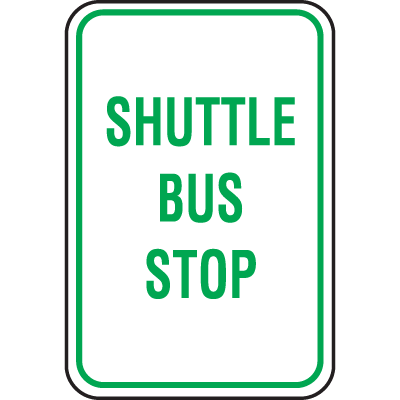 Choose from a variety of school bus stop signs, including a Recycled Plastic Shuttle Bus Stop Sign. This bus stop sign is made of 100% post consumer plastic to offer an eco-friendly option that is guaranteed to resist denting and chipping. 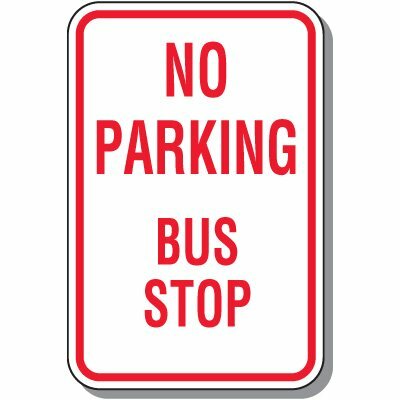 We also offer a No Parking Bus Stop Sign that ensures proper parking procedures are followed in bus areas. These traffic signs are designed to last in harsh outdoor conditions for between 5-7 years, making this both a smart and economical choice. If you’re looking for something a little different than a sign, then consider using a School Bus Stop Stencil. This heavy duty polyethylene plastic stencil shows a graphic of a school bus with the words “Bus Stop” underneath to deliver a clear message to drivers to drive cautiously to protect children. Don’t wait, post a bus stop sign today to protect bus riders, pedestrians and motorists from unnecessary accidents.